Step 1. Create a new layer (call it Aura1 so you can keep track of it), and draw a big fat line where you want your aura to be. Step 2. Apply Gaussian Blur to the Aura1 layer, making sure that it’s very blurred. Step 3. Create a new layer (Aura2), and draw a smaller, lighter coloured aura line. Step 6. 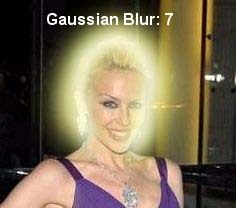 You guessed it, more Gaussian blur. Again, less than the last one. Step 8. With the eraser tool, erase the bits you don’t want around her face. It’s often easier to see what you’re doing if you drop the opacity of the merged aura layer to about 50%. Start with the opacity set to 100% for the main part of her face, and then drop it to 20-30% with a smaller brush size when you get round to doing the edges of her face and hair. This gives you a little more control at the edges and stops it from looking really harsh. It also leaves a little aura colour on her face which looks more natural, as she is clearly glowing with some mystical Australian life force.